Two of the many difficult decisions that a farmer has to make is how and when to pass the farm on to the next generation. 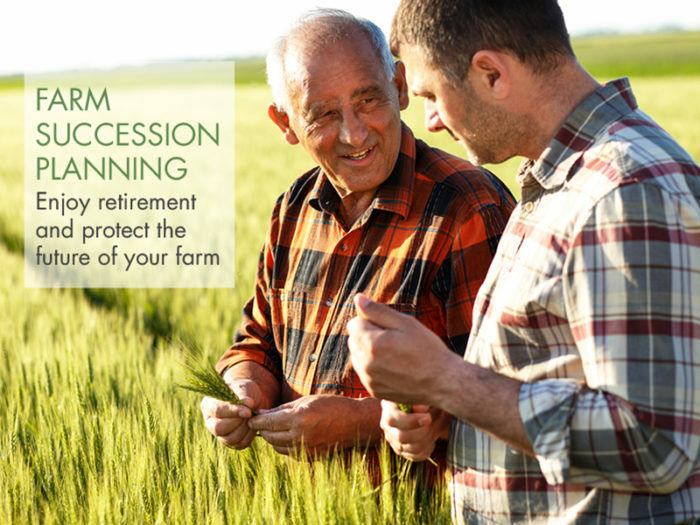 Farm succession planning is different for every farming family. That’s because every family is unique. However, there are some common challenges that people face, as well as common factors that most succession plans should consider for the best chance of success in the future. That’s what’s covered below. One of the main difficulties faced is that the farm usually makes up a large chunk of the family assets – but it’s generally not spread evenly between all the children (more about this below). Those with the best farm succession plans seem to be those that communicate best. The first thing we recommend is that everyone voices their expectations so that there are no surprises that can “blindside” you. Remember too that it is essential to the business operations that any conflict around the succession plans does not impact family members working together for the good of the business. Don’t expect to start the planning process and finish it in a couple of hours or days. Generally, a great deal of thought must go into your plan. Assistance can be sought from the family accountant or farm advisor. At some point, the services of a competent lawyer will likely be required. This lawyer should be experienced in dealing with succession issues. You should expect multiple versions of the plan before a final one is settled on. Even then, it should not be considered a “set and forget” document. Circumstances do change and the plan should be flexible enough to accommodate these changes so that it can be revisited and revised as necessary. What’s the starting point with creating your farm succession plan? The suggested starting point for farm succession planning should be an understanding of the family business structure. We produce a mud map for clients that shows who owns what and how that ownership is structured. It is not uncommon to have parcels of farming land held by various entities, such as trusts or (in some cases) old probate companies. In most instances, it is not the ownership that needs to be passed on but control of those various entities. We mentioned earlier that the value of the farming operations constitutes a large part of the family assets. Consideration needs to be given to ensure that family members who elect not to remain on the farm receive some share of these assets. Normally, this is not an equal share and, in most cases, nor should it be. Those who remain on the farm often work long hours for many years at little or no reward other than one day being nominated to run the enterprise. Generally, we try to use the structures that have been put in place to ensure that there will not be any changes should one of the family members challenge the estate. As much as possible, the succession planning should be outside of the will, as this protects it from that sort of challenge. Superannuation funds can also represent a tax-effective way of funding one generation out of the farming operations. Tax deductions can be received for contributions to the fund, which then produce the cash flow for tax-free pensions to be paid to retired members. It’s important that all family members impacted meet to discuss the plans. Sometimes there is conflict between family members and they may be better represented by someone else in these meetings. Your accountant can also act as the chairman of the meeting, providing a good opportunity to answer any tricky questions that arise.